Take a pan and boil milk. Add sugar, sabodana and let it boil. Stir it frequently otherwise it will stick at the bottom. Add cardamom powder. Cook it till it is done. To check it, press it between two fingers and if it is soft then it is done. It will be slightly sticky. Let it cool. Take 3 glasses. At the bottom put 2-3 teaspoon of strawberry syrup. Make second layer of sabodana milk, again 3rd layer of strawberry syrup. 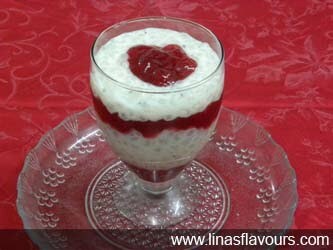 Again have the 4th layer of sabodana milk and on the top a spoonful of strawberry syrup or strawberry. Prepare 3 glasses like this. Put it in the refrigerator for 1 hour for setting. Serve it cold.